IPG and The Advertising Club of New York examine "their truth" at the Paley Center. 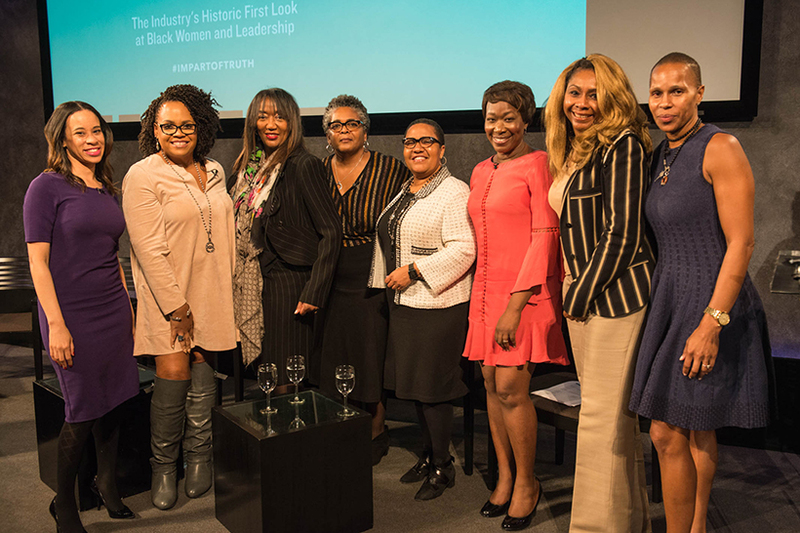 The Interpublic Group and The Advertising Club of New York hosted a frank discussion about what it’s like to be a black woman working in marketing and communications at the Paley Center for Media in New York on Monday night. 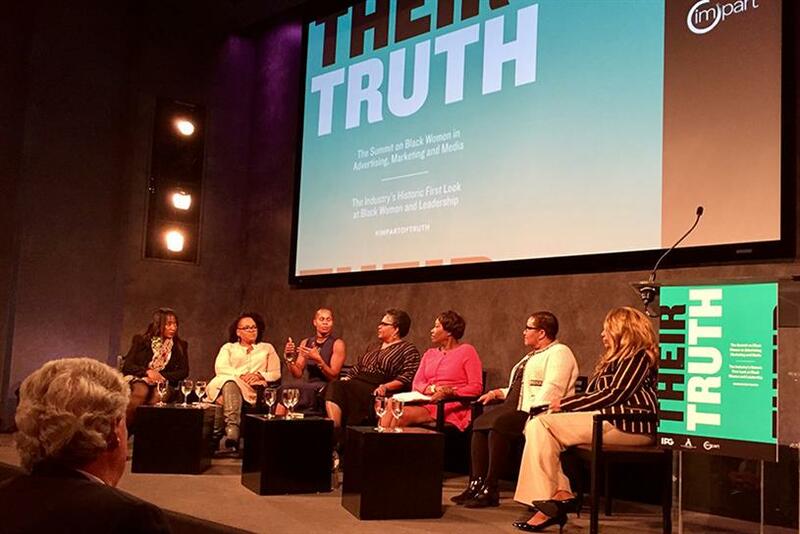 A night of programming billed as "Their Truth: The Summit on Black Women in Advertising, Marketing and Media" tackled the industry’s diversity issues head-on, sharing research about black female leadership and personal stories from industry luminaries about survival and success. Speakers included advertising veteran Valerie Graves, who read from her book "Pressure makes Diamonds: Becoming the Woman I Pretended to Be," and a panel discussion moderated by MSNBC’s Joy Reid that included Jocelyn Carter-Miller, president of TechEdVentures and SoulTranSync and IPG board member; Pam El, CMO of the NBA; Vita Harris, chief strategy officer of FCB; Jeanine D. Liburd, EVP of marketing, corporate communications and corporate social responsibility at BET; Lisa Price, SVP, founder and creative director of Carol’s Daughter; and Carol H. Williams, CEO and chief creative officer of Carol H. Williams Advertising. Here are five key takeaways from the event. Sheryl Sandberg doesn’t need to convince black women to lean in. A study from the Center of Talent Innovation found that women black women are more confident than white women and more likely to hold a graduate degree. Tai Wingfield, SVP of communications at the organization, kicked off the evening with findings from the 2014 study "Black Women: Ready to Lead." The non-profit surveyed black and white women employed in white-collar occupations and found that 22 percent of African American women aspire to a powerful position with a prestigious title, compared to just 8 percent of white women. What’s more, they’re 9 percent more likely than white women to hold a graduate degree, with 71 percent earning Master’s degrees and 65 percent earning doctoral degrees. And when black women get promoted, they’re 44 percent more likely than white women to be confident that they can succeed. "I understand the unique insights we bring to the table as black women, and if our organizations and our clients fail to tap into those insights, we all stand to lose," Wingfield said. Black women are doing it all, she added, pointing out that 54 percent of them out-earn their spouses or partners and 43 percent hold leadership roles outside of work, giving back to their communities in the form of mentorship and involvement. 2. "Racism in the workplace isn’t my problem—it’s theirs"
If black women are more confident and more qualified, then why aren’t they running the show? One reason is inherent racism, according to the panelists. Bosses promote talent who look and act like them, which creates a majority of straight, white men in positions of power. But FCB’s Harris advised African American females to not internalize racist experiences, citing an experience from early in her career when her boss asked her to be taken off a piece of business because the client was uncomfortable with her skin color. "I didn’t see that quite honestly as my problem," she said, causing the room to erupt in laughter. "One of the things I see often is that young, black women take that on as their problem, and that discourages them, that causes them to exit this industry." It’s the company’s responsibility to address those problems, she said. "I always see it as the other person’s problem, so in that particular instance, I asked, ‘What is the company going to do?’" recalled Harris. "What ultimately happened was the agency that I was working for at the time resigned the business. I had to have a voice in that; it didn’t just happen on its own." TechEdVentures’ Carter-Miller, who once worked as the CMO of Motorola, reflected the time she was up for a promotion to lead the company’s Latin American division. Rumors flew that her colleagues didn’t think a "tall, black woman" should be considered, which made Carter-Miller confront the sector president and say, "If you have a problem with my qualifications, we can discuss that, but if you have a problem with my packaging, then this is not the company that thought it was nor the company that I want to work for." Agency founder Williams, however, advised women to take a more tempered approach when dealing with workplace adversaries. She quoted a line from "Star Trek," in which Spock’s mom said, "Control your emotions, or your emotions will control you." Her cool-handed approach has served her well over the years, elevating her from "a kid on Chicago’s Southside" to "making millions of dollars" as one of the few black women to run her own eponymous advertising agency. "In my mind, I’ve knocked the hell out of some people," she said. "But guess what? They didn’t know it." From left to right: Tai Wingfield, Lisa Price, Carol H Williams, Vita Harris, Pam El, Joy Reid, Jocelyn Carter-Miller, Jeanine D. Liburd. 4. Black women need to be invited in. Not only do black women in advertising need to be included in conversations, Carter-Miller pointed out that the black consumer needs to feel wanted, too. "One of the things that always struck me about multicultural marketing," she said, is "the difference between a black consumer and a white consumer is that black people need to be invited in. We need to feel we’re welcome here. We do." Inclusion was the main theme of the night, from the importance of finding a sponsor or mentor to creating a work culture that values diversity. For IPG’s part, CEO Michael Roth said he views diversity events as "recruiting opportunities." "Frankly, if the industry doesn’t" hire more black women, he said, "we’re going to do it at IPG and use it as a competitive advantage." With 40 percent of its board members being female, IPG is committed to inviting women, especially black women, in. 5. The biggest lie in advertising is "I can’t find them"
When it came time for audience Q&A, NBA’s El bounced in her seat for the chance to answer the question about what agencies and brands can do to diversify their staffs. Companies need to work harder at finding candidates, she said. "The problem is CEOs go to used car lots to buy new cars," she said. "You find the same people who you’ve interviewed before. If you wanted that talent bad enough, you would go find it. "The sad part is, I’ve been in this business for 30 years, and we’re still talking about diversity 30 years later," she added. "I believe the biggest lie that’s ever been told in advertising is ‘I can’t find them.’ That is bull."